The 'Monastic Island of Reichenau' developed around an influential Benedictine Abbey from the year 724. It lies in Lake Constance in southern Germany. The Abbey of Reichenau housed a school, and a scriptorium and artists' workshop, that has a claim to having been the largest and artistically most influential center for producing lavishly illuminated manuscripts in Europe during the late 10th and early 11th centuries, when this area belonged to the Holy Roman Empire. The Abbey reached its apex under Abbot Berno of Reichenau (1008-1048). During his time, important scholars, such as Hermannus Contractus, lived and worked in Reichenau. It has taken me 17 years, but in late June 2016 I finally ´finished´ Germany: I have now seen all 40 WHS in this country. The last one left to do was the Monastic Island of Reichenau, some 10km from the border with Switzerland. I visited it on a day trip by car from Zürich Airport. Unfortunately my camera had broken down two days before when touring the Swiss Alps, so I can only show some images taken with my smartphone. 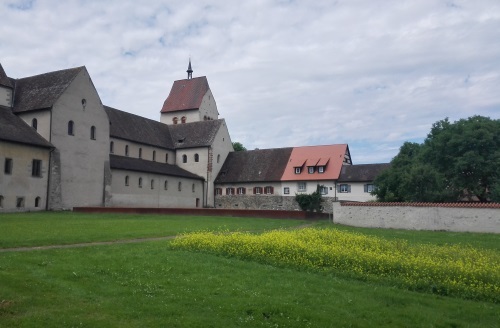 The Monastic Island of Reichenau originated in the 8th century, when the traveling monk Pirmin founded the first monastery on this island in Lake Constance. Some 24 other churches and chapels were added in the remainder of the early Middle Ages, and religious relics were shipped in (often gifts by pilgrims). The large Benedictine monastery developed into an important center for study and arts in the empire of Charlemagne and his successors. The island also is very suitable for agriculture (then and now), so the monks could be self-sufficient. Nowadays it’s a holiday island with only 3 churches left. Many tourists arrive here by bicycle from Konstanz. The island covers just over 4 square kilometers, so all is easy to reach. There are three villages, and the middle one of these (Mittelzell) has the most amenities. This is also the site of the main museum of the island, and I made that my first stop. The history of the monastery island is told using information panels and replicas. The original pieces, such as the exquisite miniature paintings made by medieval monks, are unfortunately kept elsewhere. Within walking distance lies the Münster (the former Monastery church): its Treasury does hold some original relics and art, but unfortunately it is closed on Sundays. From the last review of this WHS (thanks Clyde! ), I knew that I had to time my visit well to be able to see the murals of the St. Georg Church – the undoubted highlight of this island. 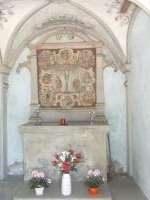 To lessen the impact on the wall paintings, the church is open only twice a day during summer and by guided tour only. So together with some 20 other tourists, I waited patiently in front of the little church until the guide showed up exactly at 12.30. He collected 2 EUR from each visitor, and started his talk not before having locked the church doors again behind us. About two-thirds of the church interior is covered in paintings, which have been repeatedly restored in recent years. And although they are a bit faded, they still look good and complete. The paintings date from the ninth to the eleventh century. The main ones display eight scenes of miracles performed by Jesus. Especially the Lazarus Resurrection scene is very remarkable (with two onlookers holding their noses because of the stench involved in digging up a 4-day old body). I liked the way the guide quietly told his story (in German only) and pointed out the many details in the murals. Despite the interesting medieval wall paintings, this isn’t an unforgettable WHS. One wonders if Reichenau would stand a chance if it was nominated in 2016. We discussed it (or rather: we did not waste a single word on it) in its context during the WHS Top 200 and awarded it with a ‘No‘. The site was added to the WH List relatively late, in the year 2000. It ticks the boxes of Carolingian Empire (10x represented, including the very similar St. John in Müstair (1983)), Benedictines (26x represented, including Lorsch and again St. John in Müstair) and 8th century (German alone has Aachen (1978) and Lorsch (1991) to represent this century). 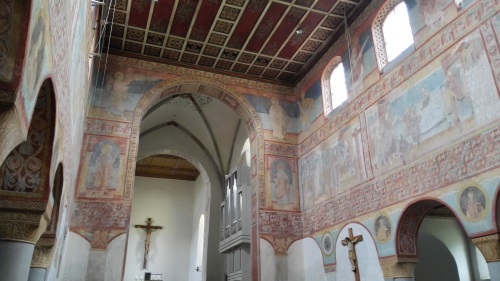 I’d say that both the Carolingians and medieval Christian wall paintings were already represented well before Reichenau was admitted to the List. Germany stated that there is "No significant comparison north of the Alps" (but just a few km’s south of it, in Müstair there is!). The reasoning relies heavily on criterion vi (important artistic centre), but this resulted in mostly moveable objects now safely stowed away in museums and treasuries outside Reichenau. I visited this WHS in July 2014. I spent 1 night and 2 days here and had a great time exploring the island and the nearby Kostanz lake by bicycle. The loop round the island is an easy ride and after visiting the 3 churches and 3 museums, I cycled to the highest point of the monastic island to enjoy the panoramic view. The best church interior and frescoes are indeed the ones of St Georg. For conservation reasons, from May to September 2014, it's only possible to visit at 12:30 and 16:00 with a guided tour in German costing 2 euros. This is a film I made about the monastery island of Reichenau in southern Germany. (Swedish voice-over with English subtitles). I reached Reichenau Island by bus from Reichenau station on the mainland. After crossing the causeway the bus took me to Mittelzell, close to the museum and the church of SS Mary & Mark. From there I took the island bus to Neiderzell where I visited the church of SS Peter & Paul. Next stop was the ferry dock where I visited the nearby mansion of Konigsegg, before going on to Oberzell and the church of St George. From Oberzell I returned on foot across the causeway, stopping to see Schopflen, a ruined mansion, and the Kinderbild chapel, with its simplistic artworks on the way. Reichenau is a small island in Lake Constance. It can be reached in a short bus ride from Konstanz. On a sunny day, it is very pleasant to explore the island, which is about 5 by 2 km in size, by bicycle or on foot - as I did. You walk through fields and small villages, and along the scenic lakeshore. The 3 WHS-inscribed churches are located in the northern, central and southern parts of the island. All 3 were inscribed because of their medieval murals and the role the island played in the spread of Christianity in the Middle Ages. 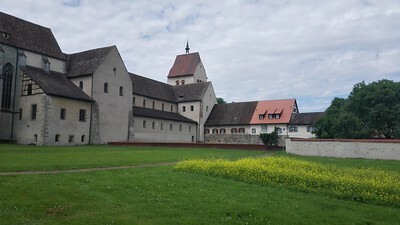 The Benedictine convent of Reichenau was closely connected to the one in St. Gall, which is only a short train ride away. The best murals can be seen in St. George, while the other 2 are less impressive. The biggest church is in the centre and has a nice treasury. The inscription on the WH list seems to be justified because of the historic importance of the island, but today there is not that much to see anymore. There is a small and very interesting museum in the main village, but today most people come for hiking and cycling. 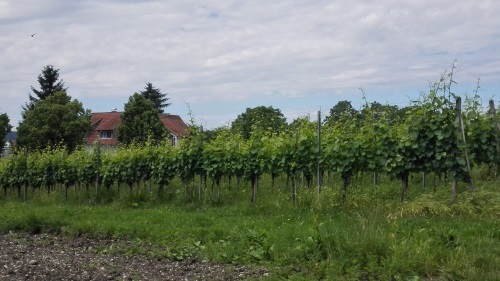 On one of our long drives across Europe to get back to the UK at the end of a holiday we had slept in our car at a Rastplatz near Konstanz and noted the presence nearby of the WHS of Reichenau Island. Thus it was that we briefly visited this Bodensee island at 7am one misty morning. In fact you hardly notice that you have left the “mainland” as you cross a small channel. The island is rolling/low lying and largely consists of fields of market garden produce. It contains several medieval churches. Luckily at that time of the morning we found one of the churches open as a lady cleaned it and replaced the flowers. The murals dating from the 10th century were certainly very fine. But should it really be a “World Heritage Site”?? The reason for the island’s inscription is that the first German Benedictine monastery was founded there in 724. The whole island was run as a “monastery” and still has 3 churches dating from 8th to 13th century. So it meets a number of criteria concerned with cultural tradition, buildings, land use and artistic work. No doubt some will say that one cannot rate such a place on the basis of a rushed morning visit and entering a single church. Michelin gives it a single “*” (“Worth a visit”) – and that is about what I would give it. If you are in the area by all means take it in - but if this deserves WHS status then the world total number should run into thousands! Reichenau is easily reached by car, bike or public transport from Konstanz (on the German-Swiss border). The island is connected to the mainland via a causeway. 157 Community Members have visited.